A must read! 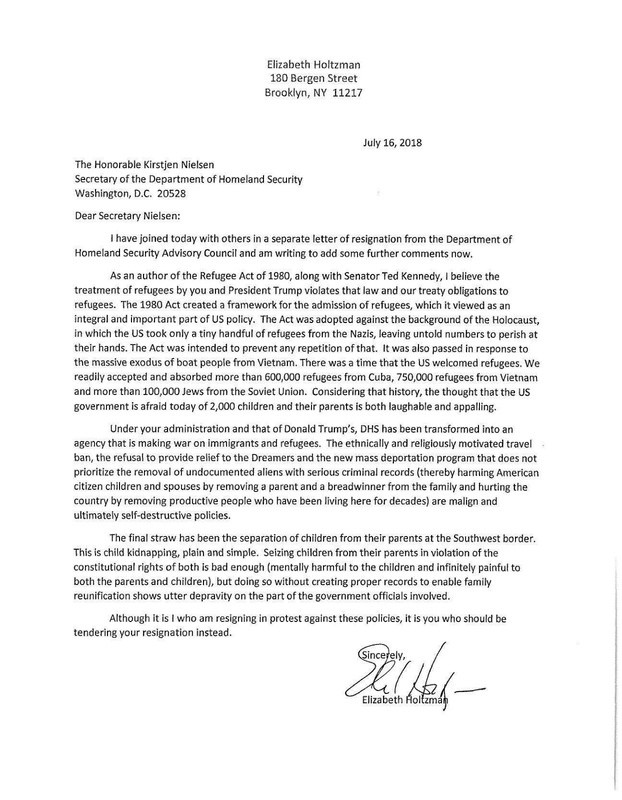 Elizabeth Holtzman's resignation letter from The Department of Homeland Security Advisory Council. The darkness that is the Trump Administration's treatment of refugees, asylum seekers, and any other non-white, non-American human within the borders of the nation, is pure evil! A call to arms that recalls America's progress and how we're now squandering it away. Four members of a Homeland Security advisory council have resigned in protest over the Trump administration's immigration policies, citing the "morally repugnant" practice of separating immigrant families at the border. Richard Danzig, former secretary of the Navy in the Clinton administration, and Elizabeth Holtzman, a former Democratic congresswoman, were among the group that announced their resignation Monday in a letter to Homeland Security Secretary Kirstjen Nielsen.